A Windows Mobile emulator can simplify mobile device testing without costing a lot of money. Whether you are attempting to develop a new mobile application, test a mobile networking configuration, or experiment with mobile device security, testing with mobile devices tends to be a pricey endeavor. There are not only the costs associated with purchasing the necessary mobile devices but also the cost of the air time used during the tests. Learn how to install and deploy the emulator in this tip. A Windows Mobile emulator can simplify mobile device testing without costing a lot of money. Whether you are attempting to develop a new mobile application, test a mobile networking configuration, or experiment with mobile device security, testing with mobile devices tends to be a pricey endeavor. There are not only the costs associated with purchasing the necessary mobile devices but also the cost of the air time used during the tests. Fortunately, it is possible to install an emulator that allows you to do most of your testing on a PC rather than on a mobile device. In this article, I will show you how to deploy a Windows Mobile emulator -- similar to the one shown below -- that you can use for testing purposes. It is possible to emulate Windows Mobile devices rather than using physical hardware for testing purposes. The first step in deploying a Windows Mobile emulator is to install Visual Studio 2005 on the machine on which you want to run the emulator. Visual Studio can be a bit pricey (roughly $550 per license for Visual Studio 2005 Professional Edition), but there are other options if you don't have the budget for Visual Studio and don't already have a copy. One option is to purchase an MSDN subscription. Purchasing MSDN won't save you any money, but it will give you access to many other Microsoft products, so it may be worth your while. Another option is to become a registered Microsoft partner. Registered Microsoft partners receive Visual Studio as a part of the registration. A final option is to order the Windows Mobile 6 Developer Resource Kit (http://msdn2.microsoft.com/en-us/windowsmobile/bb264329.aspx). It contains a 90-day trial version of Visual Studio. If you are installing Visual Studio on Windows Vista, then you will see several error messages during the installation process indicating that there are known compatibility issues. Ignore these messages and continue with the installation. When the installation completes, you must download and install Visual Studio 2005 Service Pack 1. This update is necessary even if you are not installing Visual Studio on Windows Vista. This service pack is over 430 MB in size, so if you happen to have an MSDN subscription, you are probably better off getting the service pack off the MSDN DVD than downloading it. If you are installing Visual Studio on top of Windows Vista, then there is one more update that you are going to need. Microsoft offers a compatibility update for Windows Vista. This 30 MB file must be installed after Service Pack 1 has been installed. Again, this file is available through MSDN for those who do not want to take the time to download it. The next step in the process is to install ActiveSync version 4.5. This step is necessary only if you will be running the emulator on a machine running Windows XP or Windows Server 2003. This component is not required for Windows Vista users, but an alternative component is required. ActiveSync is used to provide connectivity between Visual Studio and Windows Mobile devices. Those users who are running Windows Vista must install the Windows Mobile Device Center as an alternative to ActiveSync. Microsoft makes both a 32-bit version and a 64-bit version of the Windows Mobile Device Center. The second to last component that you must install is the .NET Compact Framework Service Pack 2. The Windows Mobile emulator is actually a part of the Windows Mobile 6 Software Development Kit rather than a part of Visual Studio. Visual Studio is simply a requirement for running the Windows Mobile 6 Software Development Kit (SDK). There are both standard and professional versions of this SDK available. For the purposes of this article, I recommend downloading the professional version because it provides you with several more device resolution levels than the standard version does. The Windows Mobile 6 Professional SDK is 454.7 MB in size. You have now installed all of the necessary components to use the Windows Mobile emulator. 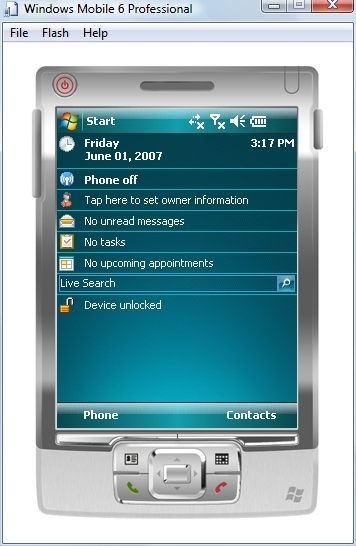 The emulator is designed to emulate a number of different Windows Mobile devices and versions. In Part 2 of this series, I will show you how to access and configure these various emulators. Part 2 offers techniques for accessing and configuring the Windows Mobile emulator.